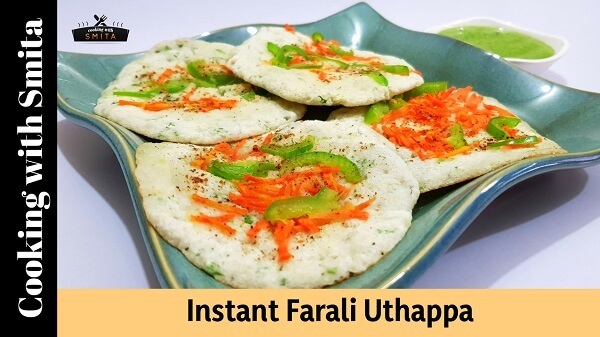 Instant Farali Uthappa, you can also call it as Upvas Pancakes – made from Sama Ke Chawal & Sabudana, a Upvas Special Food you can eat during Fasting Days like the Holy month of Shravan, Navratri etc. A Very Easy and quick Uthappa recipe takes just a few minutes and it’s delicious too. A special Chat Masala made for Fasting Food is a must and I’m also sharing below a list of ingredients. Coarsely grind Moraiyo & Sabudana in a mixer grinder. In a large mixing bowl, add ground mixture and Buttermilk, mix well. Add Fresh Coriander, Ginger & Green Chilli Paste and Rock Salt. Add 3 – 4 tbsp. Water (as required), mix well and prepare the batter. Heat Dosa pan over medium-high flame. Spread Clarified Butter on the hot pan. Just before preparing Uthappa, add soda in the batter and mix well. Pour the Uthappa batter on the pan using a spoon and spread to make 2 – 3 small size Uthappa. You can also prepare large size Uthappas using the same batter. Add some grated Carrot and sliced Capsicum on the top of Uthappa. Sprinkle some Chat Masala (check ingredients above). Press the vegetables gently so that they stick to the batter. Cook for about 1 & ½ minute until they turn golden brown at the bottom. Flip over Uthappa and cook for about 30 seconds on the other side. Instant Farali Uthappa is ready to serve. Serve immediately with Upvas Chutney.